The 3M 9322 FFP2 respirator with Cool Flow valve provides reliable, effective protection against fine dust and particulates. The FFP2 designation means the respirator reduces airborne particles by a factor of 10 when correctly used. 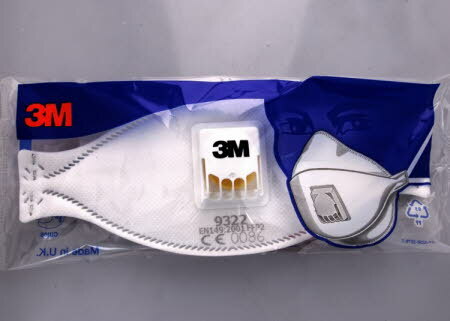 The 3M 9322 FFP2 respirator is one of 3M’s Comfort series of respirators with a three-panel Flat Fold design for improved comfort, fit and enhanced communication. This new generation of respirators provides comfort and style without compromising performance. The even strap pressure improves comfort on the neck, face and head for a comfortable and secure fit. The 3M Cool Flow valve reduces heat build-up to offer cooler, more comfortable protection, and removes exhaled air to minimise misting of eyewear. The individually packed, foldable design prevents contamination before use and allows easy storage. These respirators are designed for continuous all-day use for long periods in an industrial environment. Most natural dye workers will intend to use it for occasional and short periods, and it can then it can be used repeatedly and folded away when not required. Replace when the respirator becomes unclean, dusty or there is any impediment to free flow of air through the valve.